Wednesday, I forecast a change in weather pattern that would result in the Central Plains receiving a break from the drought and from this spring's infernal wind. I am still very optimistic. 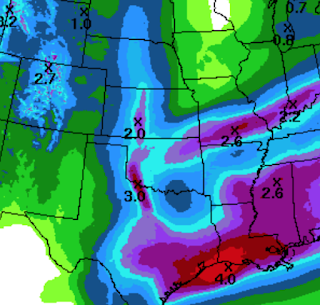 I think the forecast geographic pattern of the rain is quite good and, maybe, just a tad on the low side. When talking about rainfall distribution forecasts, don't take the locations too literally. For example, the area of blue (about .5 to .8 inches) may be in the northern Flint Hills as shown, may be somewhere else, or may not occur at all. 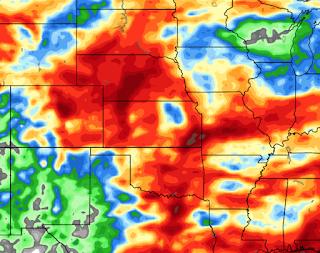 The point I wish to emphasize is that the weather pattern has changed and, for at least the next two weeks, will be quite conducive to soaking rains in many areas of the Plains.